CLARKS SUMMIT, Pa – Pink packaging is prominent again this October at Eagle Cleaners in Clarks Summit. Dry cleaning, laundry, and repaired and restored boots and shoes are dressed in pink this month. It’s all part of Eagle’s commitment to help cleanse the world of breast cancer, the most common type of cancer in Pennsylvania, according to the American Cancer Society. The hangars, bags, and packing paper passing through Eagle Cleaners’ doors every day are more than a symbol and generate more than just awareness. A portion of the money Eagle spends on these materials is used to fund breast cancer research. 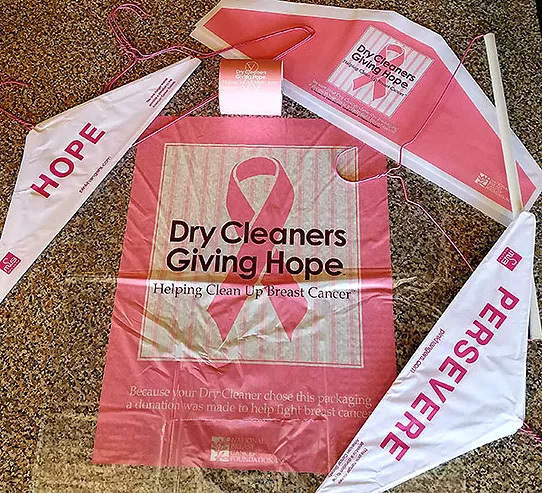 Eagle’s customers support the effort to beat breast cancer simply by continuing and growing their business with the Clarks Summit dry cleaner. More laundry and dry cleaning moving through Eagle means more packaging funding research. New this year, Eagle is offering a 10% discount to anyone who brings proof of having a mammogram in the last 12 months. Taking preventative action can save a life and a few bucks on dry cleaning and laundry. Be part of a real effort to end suffering. Visit Eagle Cleaners this month.